This morning we welcomed an adorable little girl to the farm. Peaceful Heart’s Zima was born to Zia and Maximus. She is a strong girl in a beautiful dark brown color. She rolled over as soon as she hit the ground and started trying to sit up. She soon was sitting, then working herself up to her feet. She is now walking all around the pasture and nursing well. 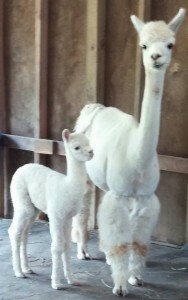 Zima is our second cria from Zia. Last year she gave us another beautiful girl, Ziva David. This is our fourth cria from Maximus, who is adding to his lovely range of colors in his offspring. Last fall he sired fawn Virgil, black Gillian, and beige Dante. Zima is the last of our farm’s seven crias to be born this season, though we are still waiting for one more cria from our lovely boarders. Zima and her mom Zia are living in the barn pasture with Gareth, Lord Cornwallis and Snickerdoodle Twist. 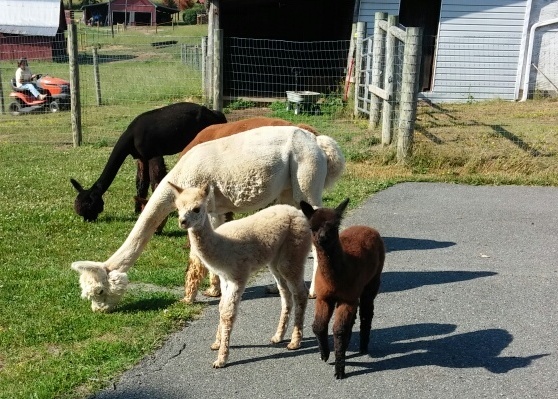 Our other four crias: Black Ice, Elsa, Merlin and Groucho Marx, are in the front pasture near the store. We hope you can come see them all soon. It’s a Girl, and a Boy, and another Boy!!! It has been a busy few days on the farm, and we have some exciting news to share. Three of our alpacas have recently given birth, and we have some great new additions to our farm. Peaceful Heart’s Snickerdoodle Twist was born on June 18 to our beautiful Sugar Cookie. 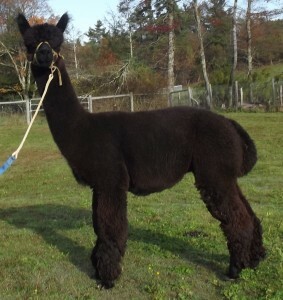 She was 16 pounds at birth and is an active girl with incredible fleece. 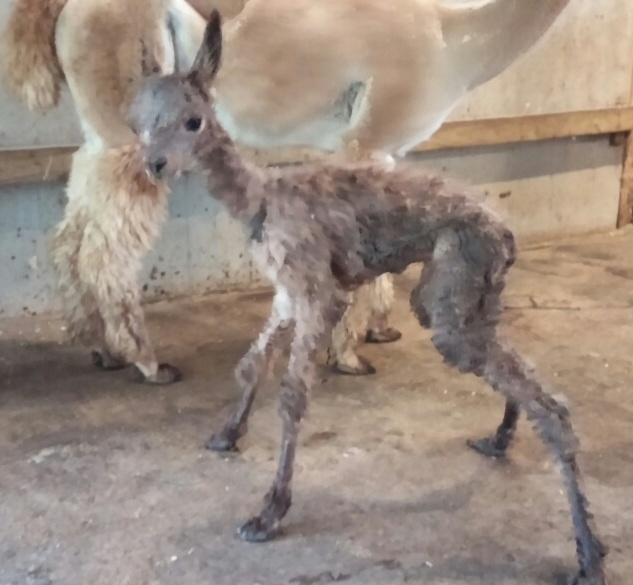 Snickerdoodle Twist had a difficult delivery, but we are blessed with a fabulous vet who was here to check on another cria and was able to identify Sugar Cookie’s problem, solve our twist, and deliver a healthy cria. Snickerdoodle Twist has already gained a pound and a half since birth, and looks a lot like her sire Lord Tennyson. She is in the barn with her half brothers Gareth and little Lord Cornwallis and their moms. Meanwhile, we’ve had two births in the pasture near the store in the past two days. June 20, we welcomed Tennyson’s Merlin of Peaceful Heart. We found this lovely little white male alpaca walking around the pasture early Friday morning. Unfortunately, his mom Bonnie Alice had some post birth complications so wasn’t able to keep up with him, but again our wonderful vet was able to come to the farm quickly and help her out. * Bonnie soon felt like nursing, and is doing great now. So is Merlin, he is gaining weight fast and reminds me a lot of his sire Lord Tennyson. He has beautiful, incredibly dense fleece and a sweet face. June 21 we celebrated the birth of an adorable light gray boy. David pronounced his name to be Peaceful Heart’s Groucho Marx as soon as he took a look at the little guy’s bushy black eyebrows. Groucho Marx’s sire is the beautiful Andean Silver. 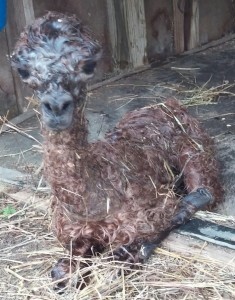 This is the first cria we have from Silver, though we have recently seen some of his lovely crias born on other farms. Groucho Marx is an incredibly tall boy who weighed 22 pounds at birth. He is running around the store pasture with Merlin, Elsa and Black Ice. We invite you to come by and see all the crias. If you have been thinking about raising your own alpacas, we invite you to take a look at our Make Room for Crias sale and give us a call. * We are grateful that alpacas generally have very few problems during birth. 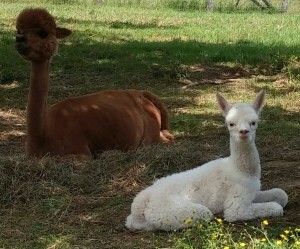 It is estimated that 95% of alpaca births are problem free. While we have had some crias that need a little help after birth, up until this week, we had only had one problem during delivery. So, out of the 68 births we have had on our farm, only 3 of them have needed assistance during delivery. Still under the average of 5%, but after this week, I’m glad that the overwhelming majority of our alpaca births are easy. 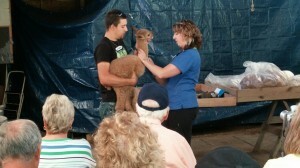 Last Saturday (June 14), we had another successful Alpaca Health and Fiber class. Thank you to all who attended. We enjoyed the great questions and discussion. In the morning, Sharla Willis of Peaceful Heart Alpacas led a discussion about alpaca fiber and its many uses; who our market is for each of the forms of fiber (raw, roving, yarn, products); and options for selling fiber without processing. We also spent a portion of the morning session sorting fleeces and discussing how to keep our sorted fleeces consistent by fineness and length to have a better quality yarn. 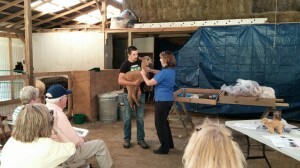 In the afternoon, Dr Heather Jenkins of Healing Springs Animal Hospital in Galax lectured on the most recent alpaca health information related to vaccinations, parasites, teeth, and reproduction. The state of alpaca research is evolving, and it was helpful to hear the findings reported at the latest International Camelid Health Conference. 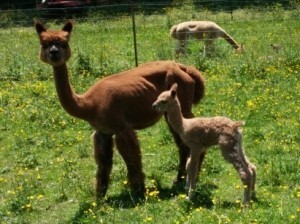 We had a special treat for the seminar this year, due to the recent birth of a new alpaca cria. He was due for his well cria check up, so Dr. Jenkins was able to demonstrate this process for the class, explaining each procedure and what she was looking for as she examined the cria. This worked very well into the lecture, providing a clear visual for many of the lecture topics. 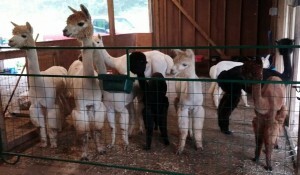 We offer the Alpaca Health and Fiber Classes every year. If you are interested in attending, check back with us for more information about the class schedule. You can also sign up for our monthly email newsletter here on this webpage to keep up with everything going on at the farm. Peaceful Heart Alpacas provides year round support for those who purchase alpacas from us, encouraging people to give us a call whenever they have questions. 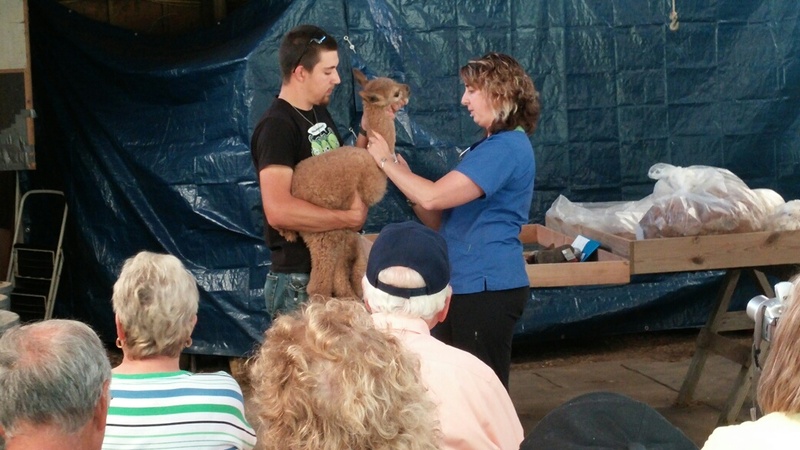 We feel that ongoing support and offering educational opportunities such as these classes is an important part of selling alpacas. We want people to be confident as they work with and care for their alpacas, and to help them stay up to date on alpaca related topics such as vaccination schedules and new ideas for alpaca products or processing options. 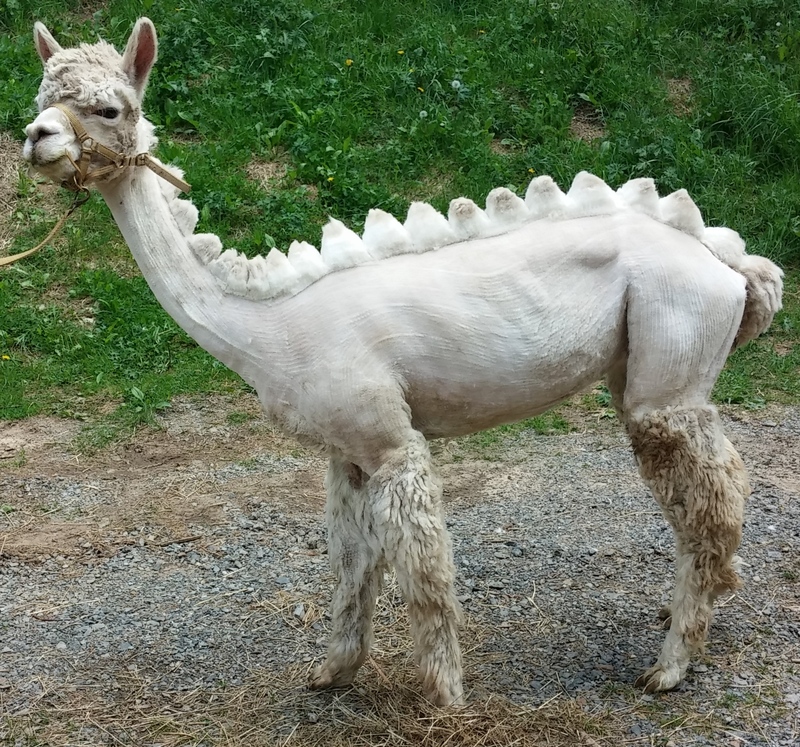 Healing Springs Animal Hospital, not only provides excellent small animal care in Galax, but Dr Jenkins specializes in Camelid Medicine and has a wide mobile service area with alpaca and llama patients throughout southwest Virginia and northwest North Carolina. She also treats camelids at her clinic, and provides boarding for those who need to receive ongoing care at her clinic. 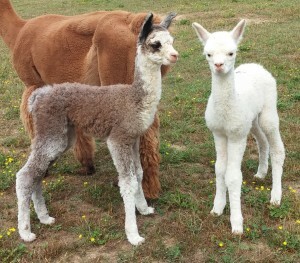 We really feel like we are in cria season now. 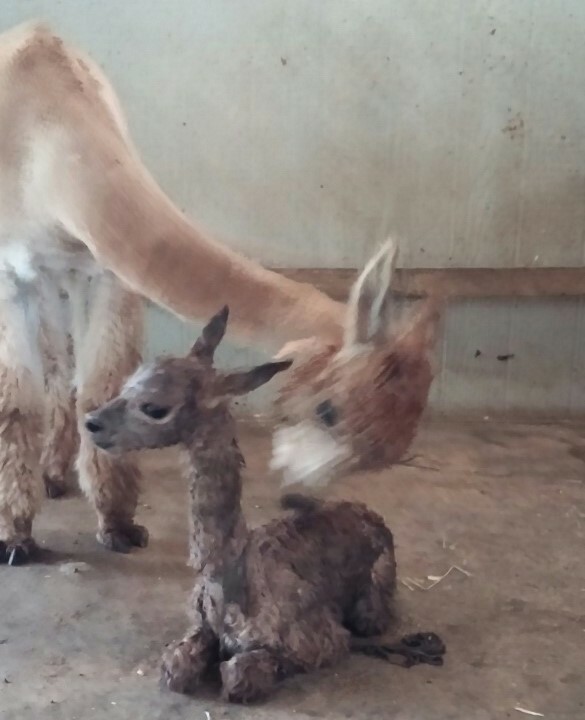 We had the birth of our fourth alpaca cria of 2014 on the farm today (June 15). June Delight gave birth to an adorable little boy this morning about 11:15. He quickly got to his feet and was moving all over the pasture. Tennyson’s Gareth of Peaceful Heart is a big boy with dense fleece, and looks very much like his half brother Lord Cornwallis who was born just three days ago. Gareth’s sire is Peaceful Heart’s Lord Tennyson. We have named all of our crias that Tennyson sired after poems that Alfred, Lord Tennyson wrote. Gareth’s name comes from the poem entitled “Gareth and Lynette” about one of King Arthur’s Knights of the Round Table. We think it is an impressive name for an impressive little guy. Everyone was very happy to welcome Gareth to the farm. The younger girls came running as soon as they realized there was a new farm member to meet, and stayed for almost a half hour until he got on his feet. Gareth is in the pasture by the barn. We invite you to come see him and our other 2014 crias. Elsa and Black Ice are growing fast. This morning (June 12), Peaceful Heart Alpacas welcomed a new alpaca cria to the farm. 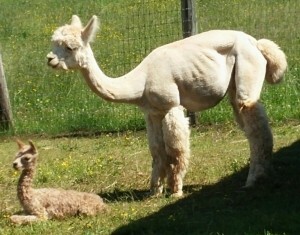 Ashley gave birth to a 16.2 pound boy with a beautifully colored, soft, dense fleece. 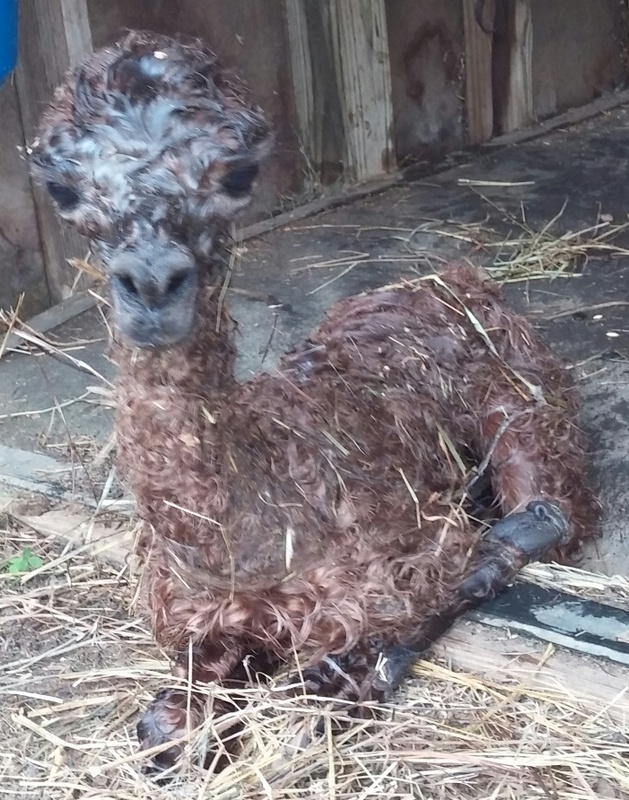 This new little cria (name still to be decided upon) is out of our fabulous Lord Tennyson, and he definitely has the look of a Tennyson cria. They all have a similar shape to their head at birth, and I suspect he will grow up to look very much like his brothers Becket and Arthur. 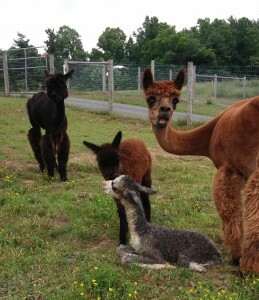 The new cria’s dam Ashley is a lovely daughter of our foundation herdsire Powergrid. Farm visitors frequently remark on her beauty and incredible color. Ashley, and her pasture mate The Black Pearl, were born on our farm, and were purchased by Sharon Wilson several years ago. Sharon’s herd grew in 2012 with the birth of Mooncake, and will grow a bit more this year when Black Pearl delivers her expected cria. Her whole herd will be moving to their new farm later this summer. 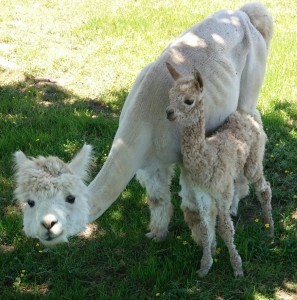 We are excited to continue working with Sharon and her family as they move into this next stage of alpaca farming. The whole farm offers congratulations again to Sharon and her family on the birth of their new cria! 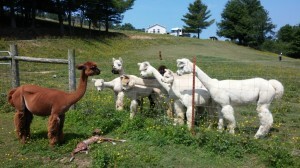 Alpaca girls watching the new cria learn to walk. Alpacas get excited every time there is a new cria born, and cannot wait to greet it and check it over. They are fascinated. We also want to offer our congratulations to Kathi and Mark of MacKenzie’s Meadow Alpaca Farm on the first cria birth on their new farm. 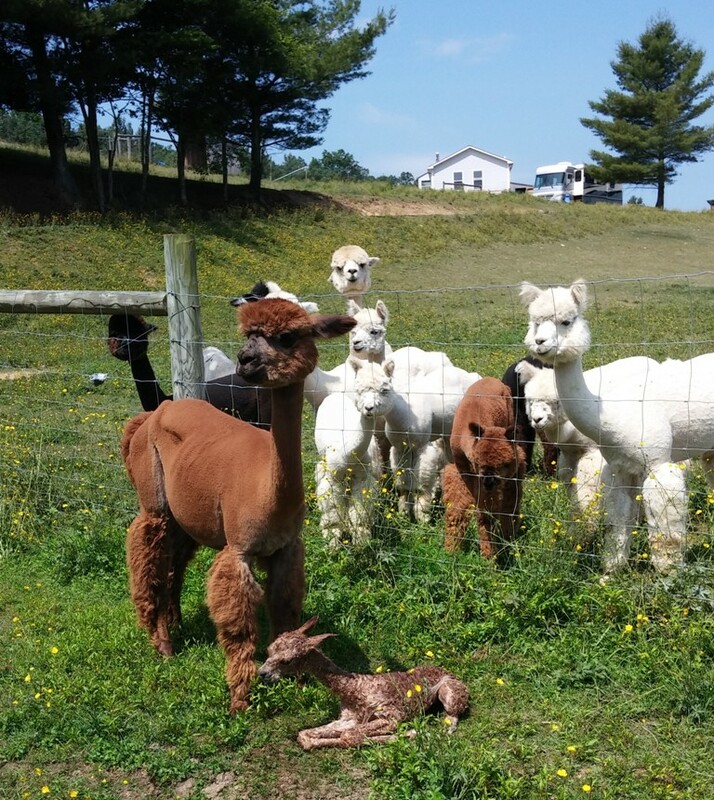 The beautiful Sunrise Surprise gave birth yesterday to another Powergrid son who looks just like his two older, award-winning brothers (Solar Flare and Sunspot have both won Highest Scoring White Alpaca at the MAPACA spin-off among their other winnings). Last year their farm celebrated their first birth while Sunny was still living on our farm. This year, Kathi and Mark are enjoying watching their newest farm member run around their own pastures, and are expecting another cria soon. 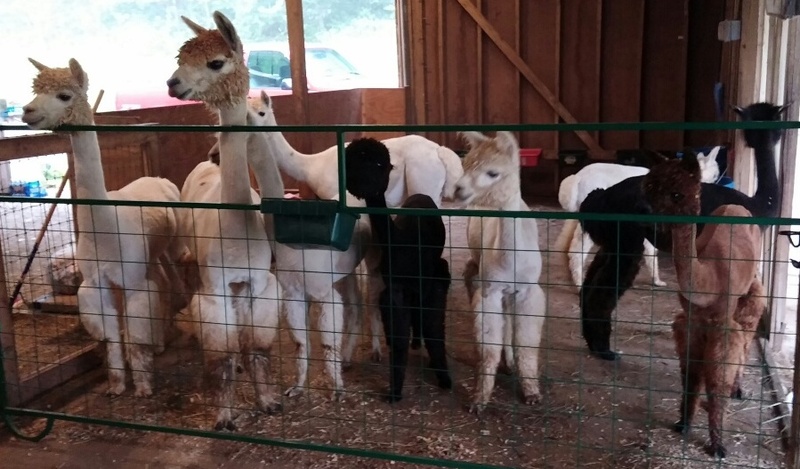 We know from personal experience that folks are not always ready to move their alpacas onto their own farms when they first purchase their alpacas. 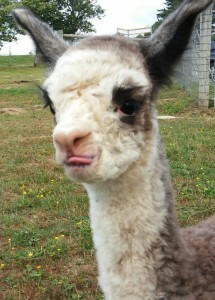 Because of this, Peaceful Heart Alpacas offers 6 months free board to anyone who purchases alpaca females from us. We also offer long term boarding for those who find that will work best for them. Check out our sales list and give us a call if you are interested in learning more about starting your own herd. 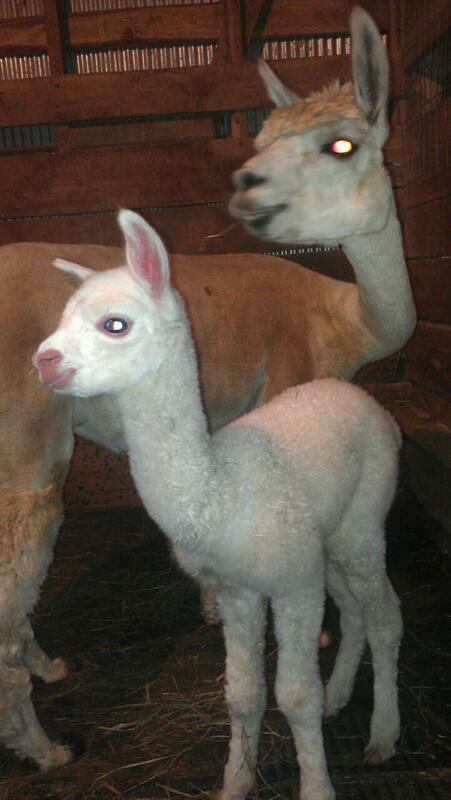 Our lovely Natalia and Polar Ice gave birth to a beautiful little girl this morning (June 6, 2014). Peaceful Heart’s Elsa is our own little ice princess, and is already up and running around. She is a good size alpaca cria (18 pounds) and is very strong. She began to try to sit up as soon as she hit the ground, and seems to have great control of her legs for an hour old cria. She is already managing the short step up and down of our shed in their pasture. Black Ice has not yet discovered his new playmate, but I’m sure he will soon and will enjoy playing with a cria his own size. Elsa is our first cria from our new multi-Champion herdsire Polar Ice. We have been anxiously awaiting his first crias, and are thrilled with our beautiful Elsa. I think she is going to look just like her sire. We invite you to come by and see Black Ice and Elsa. We are hoping that the other girls will be inspired to give birth, and we will soon have more alpaca crias running around the farm. 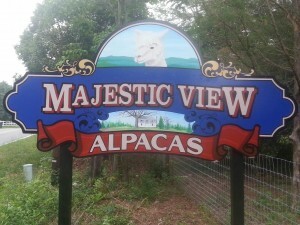 Congratulations to Majestic View Alpacas on adding two new alpacas to their lovely herd! Peaceful Heart Tennysons Ulysses is an unbelievably sweet young alpaca with fabulously fine fiber. 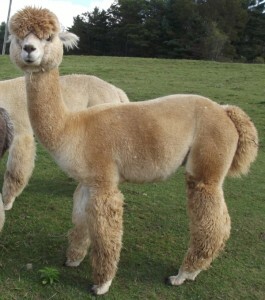 This year, he was the second finest alpaca on our farm, with an average fiber diameter of 15.4 microns. He is the son of our Lord Tennyson and Natasha, and we expect him to grow into a great herdsire with a very sweet personality, perfect for interacting with farm visitors. The other alpaca that Majestic View added to their herd is our adorable “Pacasaurus” Angelyn. She is an older girl with a calm and steady personality, and this year is sporting a pretty special haircut. 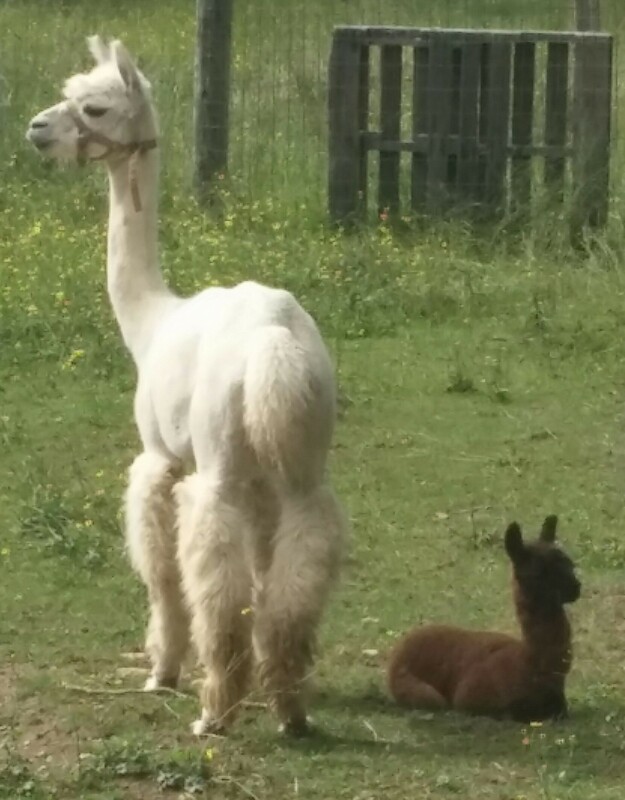 We are sure that both of these alpacas will be great additions to Majestic View Alpacas as they are getting ready to open their farm to the public soon.